In The Technomancer you take the role of Zachariah and he has access to six different talents. These all have three levels and unlock further bonuses for your hero. So you can increase attributes like health or strength of your character. In addition, more capabilities for elements like crafting can be made available. To earn experience points to unlock talents, you have to kill many opponents and complete quests. Here, you can even unlock some of the trophies and achievements freely. - Items can be stolen while Zachariah goes undetected. - stealth attacks against monsters are now possible. - You can sprint with active Stealth. - stealth attacks electrify opponents and cause critical damage. - The use of stealth attacks no longer uses any liquid. Moreover, opponents are anesthetized, without causing noise. - Your chance of success in dialogues (science) is increased by 25%. - Increase the life regeneration of you and your companions out of combat. - companion can be cured during the fight. - "use healing" by 25% of the health of your companion is restored. - Your chance of success in dialogues (charisma) is increased by 25%. - The prices of dealers will be reduced by 20%. - The material distributed damage your companion is increased by 20%. - The health of your companion is increased by 20%. - You can continue to the gather ingredients of dead creatures. - Your chance to loot will be increased by 10%. Moreover searchable articles are highlighted. - If you recycle your equipment, you will receive 25% more components. - Consumable items can also be made without a workbench. - Your chance to loot will be increased by 10%. - Your chance of success in dialogues (Mechanical) is increased by 25%. - Equipment can be recycled without workbench. - Advanced Craft plans can now be used. - The best craft plans can now be used. - Locks on Level 1 can now be cracked. - During the battle traps can be designed faster. - Locks on Level 2 can now be cracked. - Traps are more effective and cause more damage. - Locks on Level 3 can now be cracked. - When making traps fewer components are consumed. With the wide-ranging of crafting facility you can improve weapons and armor of your character Zachariah. 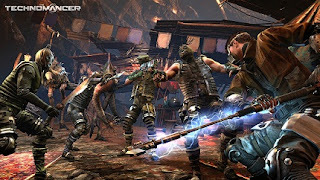 So that you have better chance to survive against oversized bosses who stand in your way in the post-apocalyptic world of The Technomancer.